Tell us about yourself. 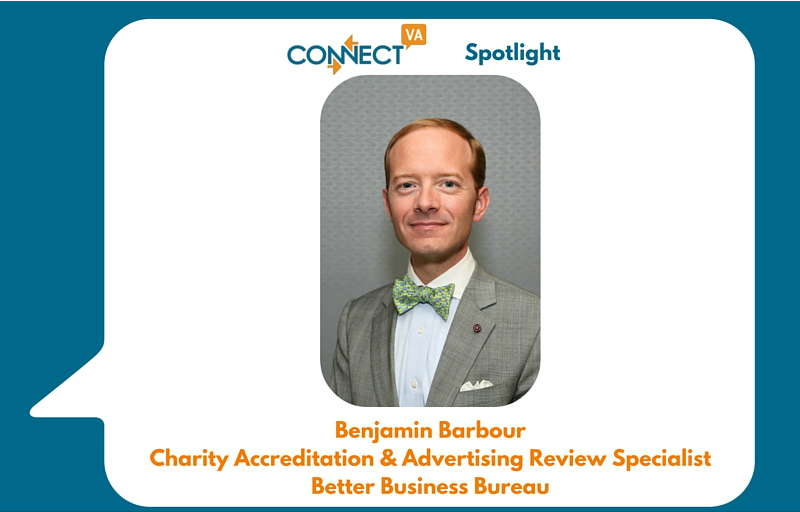 I’m Benjamin Barbour, Charity Accreditation & Advertising Review Specialist at BBB serving Central Virginia. I’ve been with BBB since early 2011 and have been responsible for our local Wise Giving programs for the past four years. In 1995 I started making Annual Fund calls as a freshman at Hampden-Sydney College (Go Tigers!). I’ve continued to volunteer for the college as a class agent, reunion chair, and a member of the Richmond alumni club leadership team. When I can, I volunteer time with local nonprofits like ROSMY, which has a special place in my heart. For the past few years I’ve been honored to serve on the board of AFP Central Virginia Chapter. AFP’s focus on ethics and excellence in fund development aligns not only with BBB’s emphasis on ethics, but with my personal values as well. What is the focus of your work, the need you are addressing? I have several responsibilities at BBB, but most of my time is devoted to our Wise Giving programs. We report on local nonprofit organizations based on the 20 Standards for Charity Accountability. The need is two-fold. Many studies, including Hope Consulting’s Money for Good, show that the vast majority of Americans don’t do any research before they donate. Even so, our culture expects so much transparency and efficiency from charities and nonprofits. Our Wise Giving reports give donors information based on holistic standards – not just financial ratios. For nonprofits, these reports are an opportunity to demonstrate their commitment to ethics and transparency through a highly recognized and trusted third party. Donors should have confidence that their funds are being used for the stated purpose – our reports are one way nonprofits can give their donors that confidence. What do you find most rewarding about your work? I review a tremendous amount of data on each organization we evaluate and I learn a lot about them in the process. Whenever possible, I like to visit them in person. All the financial, governance, and effectiveness data they send me translates into work that truly makes a difference in our community. Whether it’s a tour, an open house, or a lunch & learn, I love to see how our charities are changing lives each day first-hand. What are some major challenges you have faced and how you handled them? When I started working on our Wise Giving programs, I learned very quickly that I had some perceptions to overcome. Our evaluation process had been too cumbersome in the past, and maybe a bit too impersonal. I didn’t want to be “that guy” from BBB who just sends a form. I felt we needed to be more engaged with the nonprofit community, and spend more time telling our story to local nonprofits. Spending time talking about our program and standards one-on-one, getting involved with AFP & VAFRE, taking classes at Nonprofit Learning Point, and just trying to be present in the nonprofit community have been so beneficial in growing BBB’s programs and changing perceptions. Beyond that, I get to meet wonderful people along the way who become partners and advocates for our work, mentors, and friends. How are you leveraging ConnectVA to achieve your mission? ConnectVA is one of my top go-to resources for sharing events and learning opportunities – for both BBB and our AFP chapter. People from across the nonprofit sector and business community use ConnectVA to share their news and stay on top of what’s going on in Richmond’s nonprofit world. It’s the ideal platform for organizations like BBB and AFP to stay engaged with our own memberships and the whole region. Anything else you would like to share? I’m incredibly fortunate that we have a leadership team at BBB who value professional development. The highlight of this past year was completing NLP’s Emerging Nonprofit Leaders Program, which BBB supported every step of the way. ENLP was a truly transformational experience, and an opportunity I might not have had without such a supportive organization and leadership team behind me. A very nice photo and profile, Jamin. Congratulations!